Specifically, I’m talking about the way referrals now work. It’s long been possible to earn bonus Starpoints/Avios/Membership Reward Points for referring friends and family if they then successfully apply for a card, but the process is different now. Historically, you could only refer people to a British Airways Amex card if you had one yourself, to a Membership Reward Points earning card (eg. Gold or Platinum) if you had one yourself, etc – ie you couldn’t get a bonus for referring someone for an Amex Gold card if you only had an Amex BA card yourself. Also, the size of the bonus you received was dependent on the type of card the person you referred took out – for example, you’d receive more Points for referring someone to the Amex Platinum, than you would if they got an Amex Gold. These days you can refer friends and family for any of the cards issued by American Express and receive a referral bonus (apart from for the “Basic Card”). Say you currently have the SPG Amex card and want to refer someone for an Amex Gold – it’s now easy. All you have to do is login to your account, scroll down a bit and click on the “Refer Now” link. They will get a slightly higher sign up bonus than if they applied directly, and you’ll still get your referral bonus. 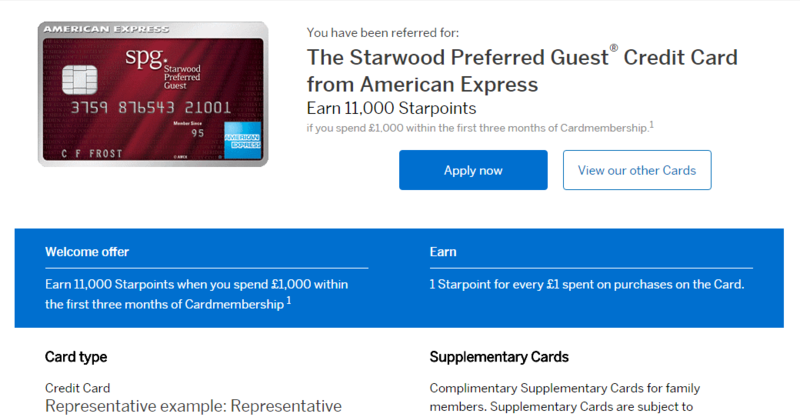 What is interesting is that your referral bonus will be in the Points ‘currency’ (Starpoints, Avios, Membership Reward Points) of the card you generated your link from, regardless of the card the person you referred chooses. Even more interesting, is that the amount of Points you get is dependent only on the card you generate your referral link from – it doesn’t matter which card the person you refer chooses. For example, if a friend asked me for a referral link for the Amex Gold and I only had an SPG Amex at the time, I would receive 5,000 Starpoints for referring them and they would receive a sign up bonus of 22,000 Membership Rewards Points (2,000 more than if they didn’t use a referral link). If I had another friend who wanted a Platinum card or the British Airways Premium Plus card, I’d get 5,000 Starpoints each time too. Yes, that’s right – if you have a Platinum card, you’ll receive 18,000 Membership Reward Points, even when referring someone for a Gold card (which is free for the first year) or the free British Airways card. The terms (linked for each card above) indicate that a Platinum cardholder would receive 18,000 Points when referring any American Express card available via your referral link – which includes cashback cards, the Nectar American Express Card and the Business versions of Gold and Platinum. The only restriction mentioned is, ” You will not receive any points if they apply for a Basic Card”. The “Basic Card” is a specific product, so it’s safe to assume you get the bonus for everything else. How does this make my own sign up bonuses bigger? So far I’ve only been talking about referring others, which is useful, but isn’t the same thing as boosting your own sign up bonuses. The thing is, there’s a quirk in the way Amex have set up the referral system which may or may not be intentional – you can refer yourself. On the same day I received my new Amex Gold in the post, my SPG Amex account was credited with a 5,000 Starpoint bonus. It’s important to be clear that this didn’t involve doing anything remotely sneaky to ‘trick’ the system. In fact, I deliberately gave my SPG card number when the Gold application asked if I had any existing cards with American Express, when I could have quite justifiably given them my BA Amex card number instead (there was only space to add one card number). I’ve even added the new Gold Card to the same online account I manage my SPG Amex from. I wanted to test this as openly as possible in order to see what happened and I’ve come to the conclusion that the system has probably been designed this way deliberately. It doesn’t really matter to Amex whether you refer yourself or are referred by your partner – the customer acquisition cost remains the same – and if they banned one method of referral, you could just use the other (or have a friend refer you, etc,). Bagging 5,000 bonus Starpoints is a very nice addition to the 22,000 Membership Rewards Points I’ll get once I hit the minimum spend on the Gold, but for Platinum cardholders in particular the situation is potentially even more lucrative. For instance, you might not normally care much about the few thousand Avios you can get for taking out the free BA card, but receiving 18,000 Membership Rewards Points on top sweetens the deal hugely! If you want to apply for your first card with American Express (so can’t refer yourself) or would rather be referred by somebody other than yourself, I’d greatly appreciate it if use my link here. You will receive a higher sign up bonus than if you just applied directly on the American Express site and I’ll get a bunch of Points too – many thanks! Have you no shame? You whine when airlines/credit cards reduce benefits/increase prices and yet you happily post ways of stealing from them. No, it’s not gaming the system, it’s just stealing from everybody else. Thanks for the comment. Obviously I completely disagree, but it’s an interesting perspective and something I think I’ll address in a full post about whether ‘travel hacking’ is ethical soon. Have been doing exactly this for the last few months! Any idea if it’s possible to have a gold and plat at the same time? You wouldn’t get the signup bonus for the gold if you already had the plat of course (because of the 6 month rule), but you might well still get the 18k referral bonus. Very interesting piece of advice. Can you please clarify the 6 mo rule? I was planning to upgrade my Amex BA card to Amex premium plus and then apply for a new Gold or Platinum card, will that work ? Cheers! Basically, per Amex terms and conditions, you aren’t eligible for a sign up bonus in a particular Points ‘currency’ (Membership Rewards Points, Avios, Starpoints), if you’ve had a card which earns the same type of Points in the last 6 months. So for example, If I had a Gold card, cancelled it, then applied for a Platinum card 3 months later, I wouldn’t be eligible for the sign up bonus. I could apply for the SPG card or a BA card though and get the sign up bonuses for either of those. Upgrading a card is different – you don’t get a sign up bonus, but Amex quite often has upgrade bonuses available (I think there’s still 20k MR Points for upgrading Gold to Plat, for example). So long as you haven’t had a card which earns Membership Reward Points in the 6 months before you apply for your new Gold or Plat, you’ll get the signup bonus no problem at all, and as long as the current system is still in place, could self-refer for that new Gold/Plat from your BAPP and get 9,000 additional Avios too. Upgrading to BAPP- will I maintain my credit limit( as its a hefty one) and as I have already spent more than 10k on AmexBA- will be eligible for a 2-1 voucher? I’m not 100% sure about the credit limit when you upgrade the BA card (I stopped chasing 241s years ago), so I’d check that with them directly, though I think you’ll be ok. Similarly, with the 241, I’m pretty sure that’s right, but hopefully someone who has done it more recently than ~4years ago will be able to confirm on here for you! Thanks for this Joe! Have been looking for a decent explanation of how self referral works. Was planning on using a different email address to self refer from Platinum -> BA Premium but it looks like I won’t have to! My pleasure Barry! As I say in the piece, it might seem a little odd at first glance but having looked at the terms etc, I’m pretty sure Amex designed the new process to allow for self referrals deliberately – not that they’d necessarily advertise that of course! The loophole you refer to is actually the main reason for holding onto the Plat card, rather than churning it. Haha, no, no supplementaries anymore – instead, can I interest you in a referral link for the free BA Amex…??? Yep, I’ll be holding onto mine too this time when I upgrade I think. Does this work if you use the referral to open any card (eg Nectar) as this opens a new avenue for earning avoid from that as well? I can’t say definitively from personal experience re Nectar, but everything in the terms indicates that is the case yes. Talking about supplementary cards another benefit seems to be 3000 rewards points when taking out a supplementary card through your online account. This is not written as far as I am aware but does trigger. So don’t apply for the supp in the sign up process. Say I use my Platinum card to refer myself for the BA card, do I need to trigger the £1000 spend to earn 5000 avios on the BA card in order to recieve the 18,000 points on the platinum? Or will I recieve the 18,000 points for simply referring/signing up for the ba card without spending anything on it? No need to hit the minimum spend – the Points usually get credited the same day (or even before!) the new card arrives. Another angle on this is whether it makes the Amex Platinum more worth getting. Suppose for example you decided the benefits of the Amex Platinum were not quite worth the £450 annual fee to you. Can you now get this card, refer one person (or yourself) for some Amex card right away, and get an extra 18,000 points? If so, you could get the Amex Platinum, meet the minimum spend for a bonus, plus do a referral for a bonus, then possibly cancel the card after 3-4 months for a pro-rata refund of the £450 annual fee. Yep, definitely impacts the numbers a bit I think. Indeed, it could potentially even persuade me to keep the Plat rather than churning it. This is what I have done for the last 6 months. I have a personal platinum charge. Referred to various ones from there – gold cc, business gold charge and my wife has the same. Prior to that we upgraded both ours to plat to score the bigger referral bonus plus got the 20k upgrade bonuses as well. Next in line is applying for Starwood, amex and nectar. I did a test run of self referral and as it worked, will be cancelling wife’s platinum. So in effect will eventually have gold biz x2 gold cc x2, Starwood cc x2, BA amex pplus (works for us this yr with one of us chasing 241) x2 (will cancel one after 3k spend) and then will try referring on ‘petty’ cards = nectar, the other random amex credit cards and maybe even green card to max out on referral points. That’s a bucket load of free points along with well timed churns. I’m not good at it but if someone is willing to do this perfectly, with the right timing and spend etc, it would just require holding 1 permanent platinum card and rest keep getting churned. And maybe partner getting a platinum when yours maxes out the 90k referral bonuses. Of course, it goes without saying you should keep a very close eye on your credit rating and time things appropriately. Else you are looking at getting screwed in the long term credit game! 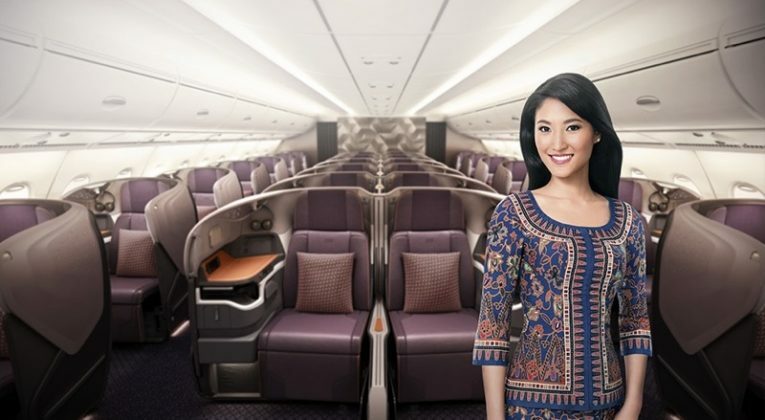 My goal is to get 2 F on SQ from LHR to SYD one way and 2 J one way (will mix and match) to enjoy their latest products. I also collect Starwood and buy them as well (looks like that’s going to finish this month) for JAL & CX flights using Alaska miles via Marriott air programme. Gets me free nights. But I don’t go for 1-5. Stick with nicer properties. You should live a little! Very nice VK!!! Once I upgrade my new Gold, I’ll be doing something very similar from now on I think. Strange – I just checked from a (free) BA card account and have the full range of options, including Nectar, cashback cards, business cards, etc. Might be worth checking using a different browser maybe (I’m using Chrome). I’m not sure if that’s been added to the terms recently or not – it’s certainly possible they might have changed things (terms and reality don’t always match, of course). Hopefully someone who has referred themselves recently can let us know if they got the bonus or not. Luke, is that because you can no longer refer for your “own card” ie the gold “charge card” as it’s not open to new members? It’s saying you can refer for a “credit card”. That’s my reading of the terms…..
Do you know if the 90k annual allowance is per calendar year or after renewing the card? Thanks! Gtellez – good question. Unfortunately I’m not sure – I never keep a gold/plat for over a year. Hopefully someone else will let us know. That’s the point of my question, I got the Amex platinum in September and already referred 5 cards, if it’s calendar year, I’ll keep the card until January to refer 5 more cards before cancelling it! It would be 180k points in few months! I hold BAPP now, do you think I can self refer to downgrade my card to free BA? Good question – I don’t have any personal experience of that, but in theory I think it should probably work? Worried that it will trigger Amex as that’s not even opening a new account! I can basically repeat the process of upgrading and downgrading the BA cards every half a year or so (and still not going over total card limits). You won’t get any referral bonus for a switch between the BA cards, it’s not a new cardmember agreement. I experimented with this last year using my wife’s referral link and she did not get any points for me downgrading the BA card. 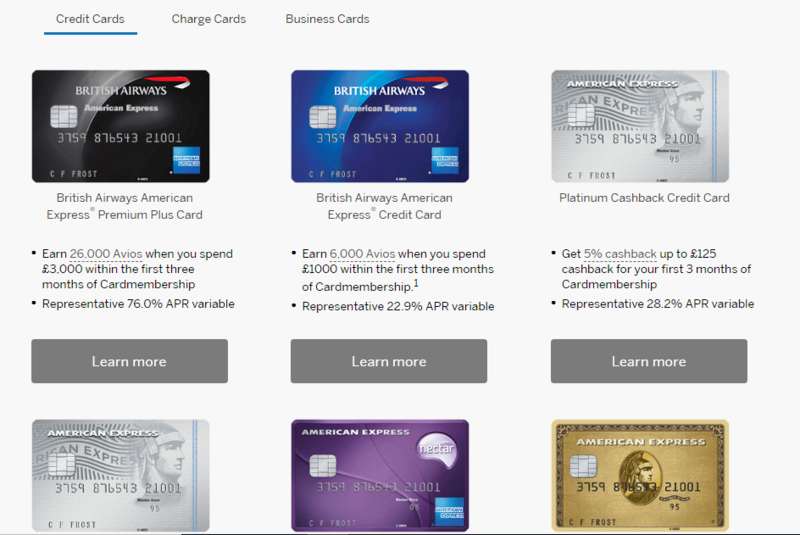 You will not be able to revert from BAPP to Blue BA Amex, that’s what I was told – it will have to be a new Blue BA card. Sorry, yes now I’ve thought about it a bit more, I don’t think it would work actually. As you say – better safe than sorry anyway really when it comes to Amex as there’s so much upside just from churning completely within the letter and spirit of the rules. Yeah it’ll be a new application (no real credit check though apparently) and new card when you “upgrade” or “downgrade” the BA card. A bit silly really but the credit account remains the same as you can only hold one of the cards at the same time. The upgrade involves no application or credit check ( from Blue BA Amex to BAPP). I was told to submit a card application over web chat and phone though when I upgrade last year. Perhaps it was a mistake as they initially treated it as a new card application until I called. Fair enough! However I think you will still get a brand new blue card, not your old one back and perhaps a different credit limit? I’ve never gone from Blue to BAPP and back to Blue again to know if it would be the same card number, but I agree it is unlikely. I can’t recall if the credit limit stayed the same, my suspicion is that it did, but it was a while ago now. Does anyone know if I add my partner as a supplementary card holder on one card (eg BAPP), and then try to refer her for a card in the same category (eg BAPP) does this exclude us from getting referal points? Ie do I have to remove her from being a supplementary card holder and wait 6 months? Hello, thanks for the information. It is really interesting. I was wondering if you have any referral link to share for the Amex Gold? So, we can get more benefits. Doesn’t seem to work any more. I had a my son in law refer me from his BAPP but the referral link only gave the choice of the BA Platinum or Blue card and I’m after the Gold Amex card. I just tested it on my Amex Plat and BA Blue right now – both still working exactly as described above. Scroll down the referral page, click on “Credit Cards” and then scroll down to the bottom and you should see the Amex Gold. Hi Guys, Thanks to Joe first of all for the referral link. If interested in am American Express Card please use my link to register to earn bonus reward points or avios. if you are new to American Express I would personally recommend going for American Express Gold Card its free for the first year and also gives good bonus and 2 lounge visits. In year 2 close this account and go for the BA Card an earn more bonus and exta avios for the spend too.